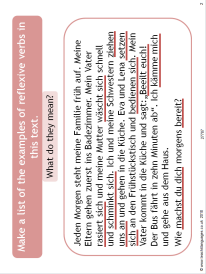 This worksheet and PowerPoint resource introduces or recaps reflexive verbs. It includes an interactive game, teaching notes and answers. Excellent resource, I am going to use it with my adult learners tonight. Vielen Dank!